"The smart outside guys, they don't say retail's dying," Ahrendts said during one part of the interview. "They say digital's going to grow at three times the rate of physical. But in the next five years...75 percent of the people will shop online — shop — but 75 percent of the business will still be done in physical stores. "And so retail's not going away, retail's not dying," said Ahrendts. "But it has to evolve, it has to continue to move. And I think it has to serve a bigger purpose than just selling." Apple has bucked the trend set by other large U.S. retailers, many of which have had to close stores when faced with the onslaught of online-based vendors like Amazon, or simply a switch to online orders at their own websites. The company now has over 500 locations worldwide. Under her tenure, Ahrendts has tried to further the draw of Apple retail by expanding in-store workshops and special events under the "Today at Apple" brand. The former Burberry CEO has even tried to rechristen the stores as "town squares" with a greater social purpose than just capitalism, though in recent months the company has made little mention of that label. 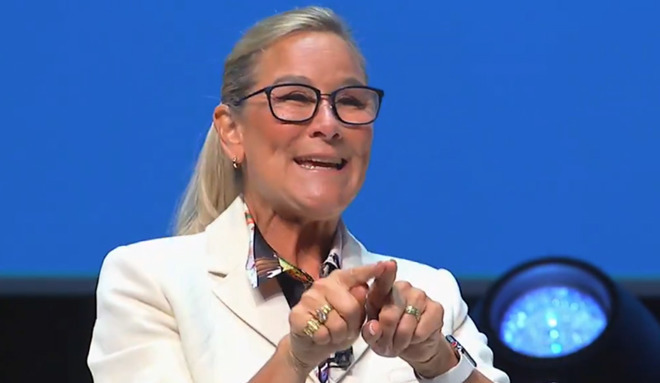 "Apple's DNA is Creativity, but..." @AngelaAhrendts on stage at #CannesLions talking about the DNA of @Apple! At Cannes, Ahrendts likewise brought up Apple's famous concept of merging technology and the liberal arts, suggesting that the company may be in "the human business" with the obligation to "humanize technology." One example of this may be its long-running Apple Camp workshops for kids, which just recently opened up 2018 reservations. The program teaches basic artistic and technological concepts while exposing kids to Apple's product line.